"Caro mitis" (which translates roughly to "ripe or bountiful fruit") is a Russian label dedicated to Super Audio CD (SACD) releases driven by repertoire (as opposed to performers, themes or places, etc.) where the excellence of the recorded sound is treated as crucial. Working with the Hermitage Chamber Orchestra, oboist Alexei Utkin has now completed a three volume survey of orchestral works of Bach which they believe are suitable for his instrument. To have called it "Works for Oboe" is a little misleading. But the spirit in which they have approached this, and the success they have achieved make it worthy of close attention. The basic tenet here behind a practice that is as old as reflection on the music itself is that the concept of the Baroque trio has more to do with the textures of the music than with the number of players; the counterpoint between melody and continuo; the musical conversations. And as these apply to Bach's orchestral works too. It is also suggested that the oboe is spiritually as well as aesthetically suited to some of the melodic weight and strength of these pieces. That, for example, the "spring" and affirmation that run throughout such pieces as the harpsichord concerto, BWV 1059, exude such joy that an instrument so close to breath (the oboe) can do it great(er) justice. After all, Bach drew on the liveliness of the dance too. Further, of course, Bach often repurposed his music, like most Baroque composers. The Orchestral Suite #4, BWV 1069, had been used as the first choral number of the Christmas Cantata BWV 110, for example. None of this is to suggest a free-for-all, that anything goes, Jacques Loussier style: these are described as "transcriptions" and/or listed with their original titles, rather than being sold – somewhat spuriously – as "arrangements". In other words Utkin and his orchestra (of 20 or so strings and woodwind, with brass and timps in just four of the movements) believe that what they are doing on this CD is communicating the essence of the music, not by trying to overlay it with "new" sounds, but by respecting Bach's intentions in tandem with the conventions of the time. For example, it is accepted that BWV 1067 was inspired by Bach's meeting with the French flautist, Buffardin. It was for him that Bach (almost certainly) wrote the flute sonatas BWV 1030 and 1032. To rework with piece with the oboe as solo instrument, Utkin is saying, is valid because it simply exchanges one "occasion" for another. What's more, it adds layers of poetical resonance, re-enforcement of the richness needed (by the oboe's timbre) to underpin the vibrancy of the dance, and maybe obliges us to look again at the ways in which a wind instrument can both offset and be offset by strings. If one, as listener, sets aside the legitimacy (or otherwise) of reworking Bach's prescribed intentions for instrumentation, which one can, one is left with two criteria by which to judge these performances: do they work in their own terms, are they homogeneous enough and not mere curiosities? And is the playing, the musicianship, up to standard? In each case the answer is Yes. The somewhat detached nature of the tempi; the grouping of the instruments on a recording that aims for auditory excellence; and the complete absence of any kind of skewing of phrasing in favor of the oboe and its never overtly virtuosic passages make for persuasive performances. Utkin remains in control throughout. If anything, he tends to produce a perhaps understated delivery of his warm, unfussy and authoritative oboe sound. It would be churlish to claim that the standard of translation from Russian to English in the essay in the accompanying booklet seriously detracts from the overall quality of this release. But it is unfortunate that it's so poorly constructed and its language is so quirky in places. Such inelegances as: "Nevertheless the desire to cognize the sweetness of the heavenly bliss, though it makes one free from the yoke of the earthy torments, does not at all exhaust the life-breath of the composer who appreciated the earthy joys" let it down; and would have been easily remedied. Given the musicology behind this enterprise, a more lucid explanation would have been helpful. 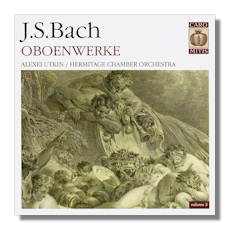 No matter; this is an enjoyable CD (as are the other two in the series) and one that can be safely recommended for identifying an area of Baroque practice in a transparent and useful way and then doing its job in illustrating it very well indeed, and with a momentum and pleasing outcome that only Bach can inspire.